We own and operate more than 1,200 facilities around the world, giving us a clear opportunity to deploy innovative, efficient and financially prudent green building strategies across our portfolio. LEED certification is one way to increase the efficiency of our buildings. On average, LEED buildings are 25 to 30 percent more energy efficient than conventional buildings. As of 2016, 11 of our buildings have been LEED certified by the U.S. Green Building Council (USGBC) and two more are pending certification. We have created a set of Green Building Standards to which all new VF facilities must adhere. And, we are using a suite of tools to make it easy for our design, real estate and construction teams to access resources on green building practices. In early 2017, construction was completed on our new Vans® brand headquarters, which is aiming for LEED Platinum, the highest certification level available through the USGBC. 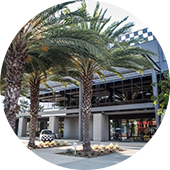 Located in Costa Mesa, Calif., the office includes a one MW solar array providing approximately 50 percent of the facility’s energy needs, 38 EV charging stations, drought-tolerant landscaping and Forest Stewardship Council (FSC) certified wood throughout. Already being called the “most sustainable building in Costa Mesa,” it represents an important model for our real estate team as they remodel, adapt and rebuild our facility portfolio according to our green building standards. The VF Outdoor campus in Alameda, Calif., is home to the JanSport® and The North Face® brands. The 160,000-square foot campus includes solar panels, wind turbines, insulation composed of recycled jeans, and recycling and composting facilities, all of which enable the campus to generate approximately 15 percent more power than it needs to operate. 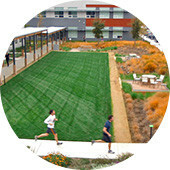 The campus landscape incorporates drought-resistant vegetation, helping to reduce overall water consumption at the facility. Moreover, the campus has a community garden that provides fresh produce for the cafeteria. 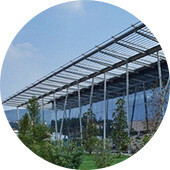 Our VF International headquarters in Stabio, Switzerland, is also LEED Platinum certified. The building operates with 100 percent renewable energy and its efficiency measures have saved 47 percent in energy costs compared to a traditional building, helping us cut 256 metric tons of carbon dioxide equivalent (MTCO2e) since 2013.